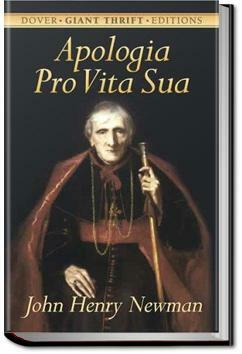 A religious autobiography of unsurpassed interest, the simple confidential tone of which "revolutionized the popular estimate of its author," establishing the strength and sincerity of the convictions which had led him into the Roman Catholic Church (Wikipedia). . . .If confidence in his position is, (as it is,) a first essential in the leader of a party, this Dr. Pusey possessed pre-eminently. The most remarkable instance of this, was his statement, in one of his subsequent defences of the Movement, when moreover it had advanced a considerable way in the direction of Rome, that among its more hopeful peculiarities was its "stationariness." He made it in good faith; it was his subjective view of it.